We’re still not rid of the real Donald Trump, which means Alec Baldwin’s Donald Trump on Saturday Night Live won’t be going anywhere either. Speaking with CNN, Baldwin confirmed that his Trump will return during the show’s next season, but his busy schedule will prevent it from being a regular thing like it was last season. 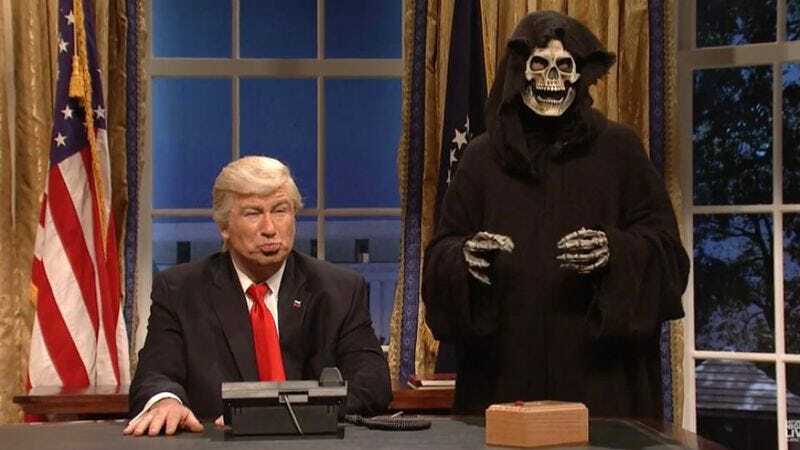 “We’re going to fit that in,” he said regarding his Trump impression on SNL, adding, “I think people have enjoyed it.” That may seem like an odd take on the “character”—which was evidently popular enough to bring back nearly every week—but Baldwin did admit back in February that he doesn’t exactly have fun playing Trump. Basically, it sounds like he’s only agreeing to come back because people responded to his Trump so positively, which goes against a comment he made in March about not knowing “how much more people can take it.” Perhaps that’s why he’s dialing back the number of appearances he’ll make, telling CNN that it will be “a couple celery sticks” instead of a “whole meal.” Either way, we’ll have less Trump on SNL, but the same, depressing amount of Trump in real life.